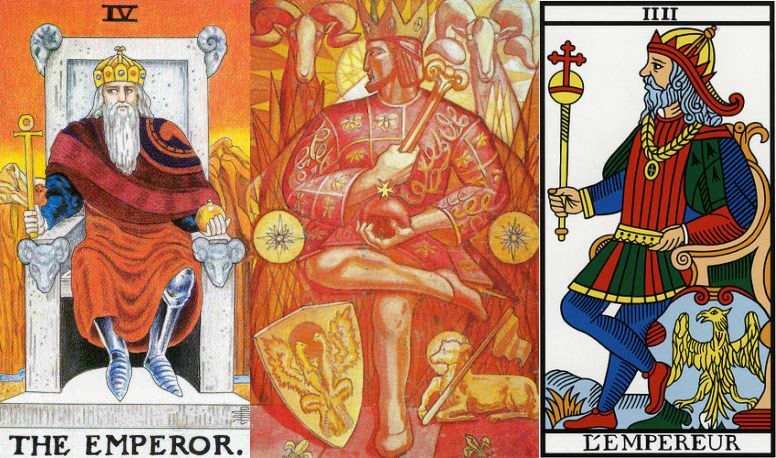 Judgement is the twentieth Major Arcana of the Tarot, but sometime different authors used different names for this trump: The Last Judgement (A. E. Waite) or The Aeon (Aleister Crowley). We’ll see how Judgement is interpreted by four important masters of tarot: the British occultist A. E. Waite (1857-1942), the Russian mathematician and occultist P. D. Ouspensky (1878-1947), the English occultist and ceremonial magician Aleister Crowley (1875-1947) and Spanish-born French occultist and founder of the modern Martinist Order, Papus (1865-1916, his real name being Gérard Encausse). In „The Pictorial Key to the Tarot“, this Major Arcana is referred to as „The Last Judgment“. The divinatory meaning of Temperance is, according to A. E. Waite, expressed by the following words: „change of position, renewal, outcome“ and the author mention that „another account specifies total loss though lawsuit“. When reversed, this card can signify: „weakness, pusillanimity, simplicity; also deliberation, decision, sentence“. In his chapter about the doctrine behind the veil, Waite tells us that The Last Judgement „is the card which registers the accomplishment of the great work of transformation in answer to the summons of the Supernal–which summons is heard and answered from within“. Then, Waite asks an important question – „What is that within us which does sound a trumpet and all that is lower in our nature rises in response – almost in a moment, almost in the twinkling of an eye?“ – and then he answers offering two different explanations, the first one for „those who can see no further“ and the second one for „those who have inward eyes“. 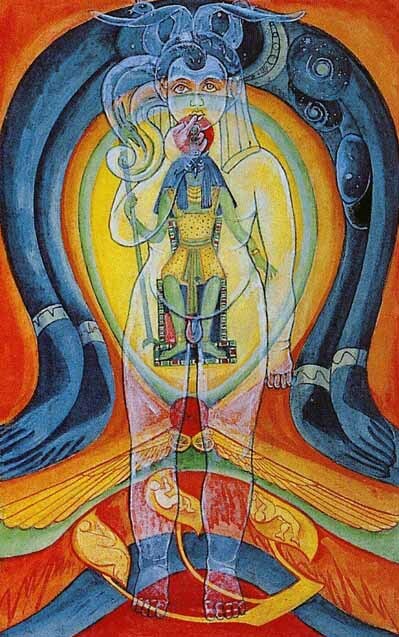 „Let the card continue to depict, for those who can see no further, the Last judgment and the resurrection in the natural body“. „let those who have inward eyes look and discover therewith. 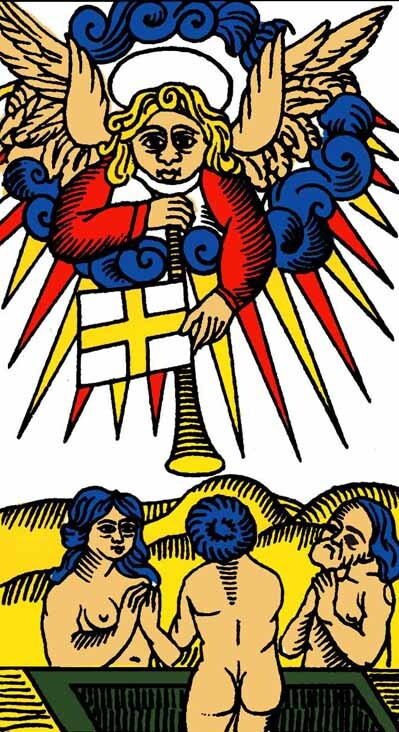 They will understand that it has been called truly in the past a card of eternal life, and for this reason it may be compared with that which passes under the name of Temperance“. „ I saw an ice plain, and on the horizon, a chain of snowy mountains. A cloud appeared and began to grow until it covered a quarter of the sky. Two fiery wings suddenly expanded in the cloud, and I knew that I beheld the messenger of the Empress. He raised a trumpet and blew through it vibrant, powerful tones. The plain quivered in response to him and the mountains loudly rolled their echoes. One after another, graves opened in the plain and out of them came men and women, old and young, and children. They stretched out their arms toward the Messenger of the Empress and to catch the sounds of his trumpet. And in its tones I felt the smile of the Empress and in the opening graves I saw the opening flowers whose fragrance seemed to be wafted by the outstretched arms. Then I understood the mystery of birth in death“. In the „Book of Thoth“, Judgement is referred to as „The Aeon“. „In this card it has been necessary to depart completely from the tradition of the cards, in order to carry on that tradition. 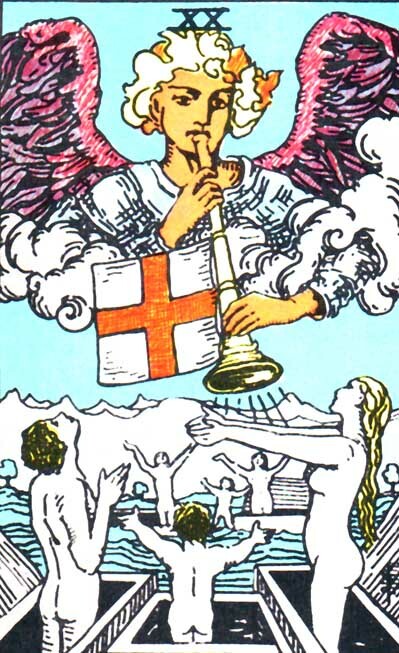 The old card was called The Angel: or, The Last Judgment. 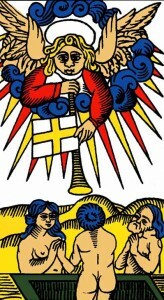 It represented an Angel or Messenger blowing a trumpet, attached to which was a flag, bearing the symbol of the Aeon of Osiris. Below him the graves were opening, the dead rising up. There were three of them. The central one had his hands raised with right angles at the elbows and shoulders, so as to form the letter Shin, which refers to Fire. The card therefore represented the destruction of the world by Fire. This was accomplished in the year of the vulgar era 1904, when the fiery god Horus took the place of the airy god Osiris in the East as Hierophant (see Atu V). At the beginning, then, of this new Aeon, it is fit to exhibit the message of that angel who brought the news of the new Aeon to earth. The new card is thus of necessity an adaptation of the Stélé of Revealing“. It is also important to study very thoroughly, and meditate upon, this Book, in order to appreciate the spiritual, moral, and material events which have marked the catastrophic transition from the Aeon of Osiris. The time for the birth of an Aeon seems to be indicated by great concentration of political power with the accompanying improvements in the means of travel and communication, with a general advance in philosophy and science, with a general need of consolidation in religious thought. It is very instructive to compare the events of the five hundred years preceding and following the crisis of approximately 2,000 years ago, with those of similar periods centred in 1904 of the old era. It is a thought far from comforting to the present generation, that 500 years of Dark Ages are likely to be upon us. But, if the analogy holds, that is the case. Fortunately, to-day we have brighter torches and more torch-bearers. 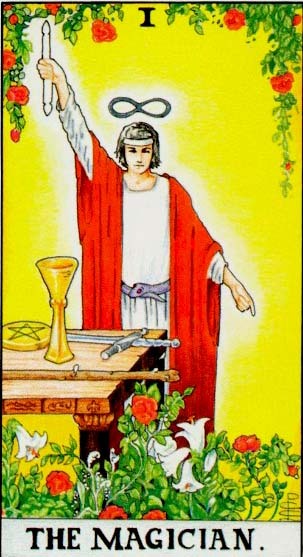 After describing the Judgement from The Tarot of Marseilles, Papus asks himself and his readers: „How can the reawakening of nature under the influence of the Word be better expressed?“. Return to the divine World. The Spirit finally regains possession of itself – ORIGINAL DETERMINED MOTION. Life renews itself by its own motion – VEGETABLE LIFE – RESPIRATION. The material world progresses one degree in its ascension towards God – THE VEGETABLE WORLD. Share the post "Judgement – Major Arcana Tarot Card Meaning, according to Waite, Ouspensky, Crowley and Papus"